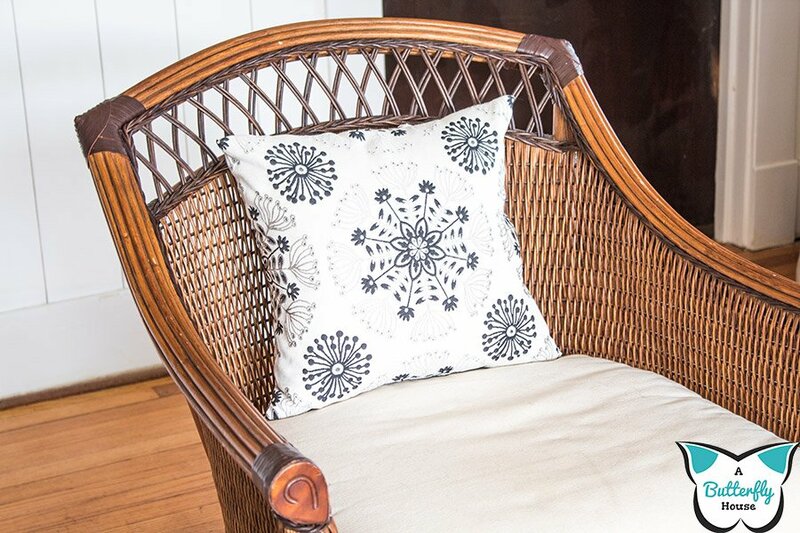 In my frantic attempts to turn my living room into a visually-pleasing location, I've found myself covering a lot of throw pillows out of pretty much any fabric I can find. My latest attempt? A fabric remnant. When I purchased the remnant at Joann's, as I paid my $2.46 the checkout clerk looked at me skeptically and said "You do realize this is only 16 inches, right?" as if it's literally impossible to make anything decent out of 16" of fabric. I smiled and commented that my pillows were small, while internally having a mild panic attack that maybe this wouldn't be enough fabric and I'd have wasted almost a whole $2.50. Spoiler alert: it was plenty of fabric. 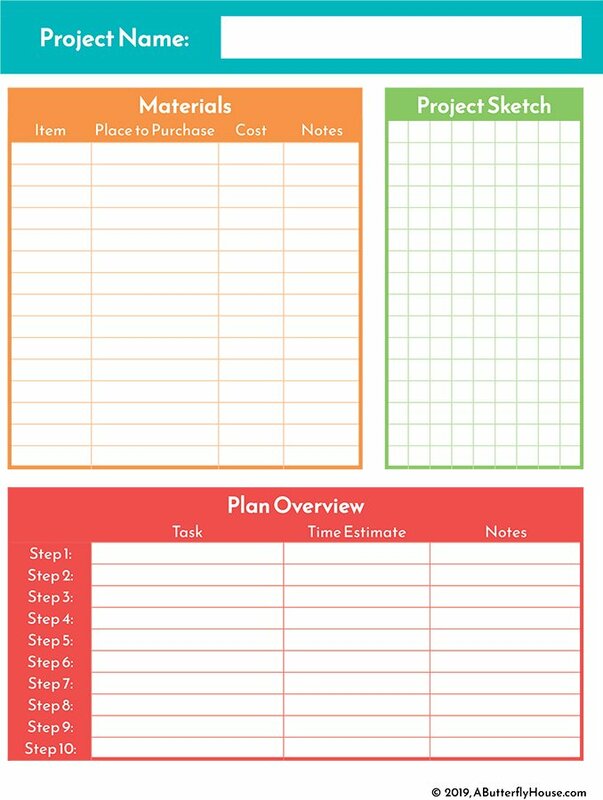 I even have a little bit left over to use on some other project! 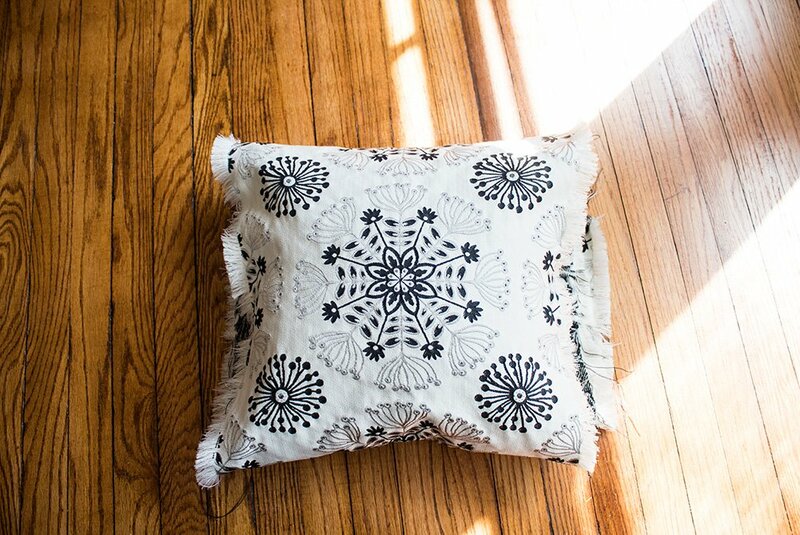 Pillow Insert- I typically purchase old pillows from the local thrift store and (after washing them) use them as pillow inserts. 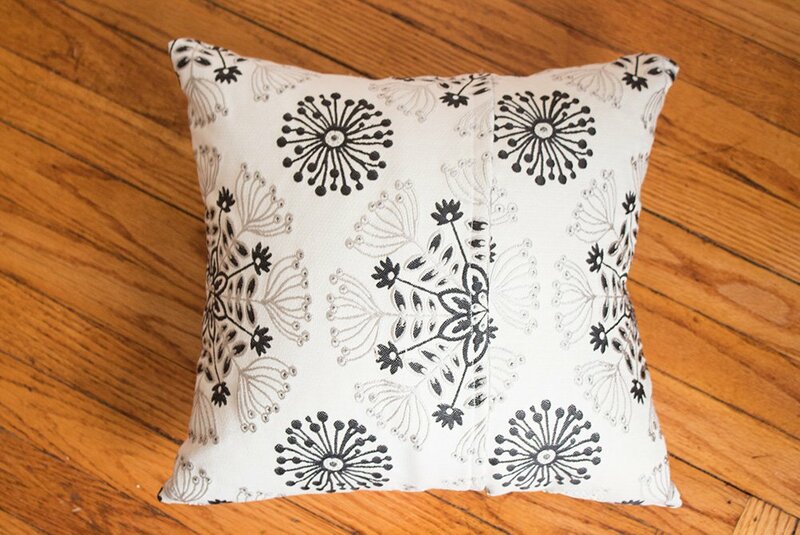 Since I can find pillows for $1 a pillow, this is significantly cheaper than throwing out $4-$6 on actual inserts. 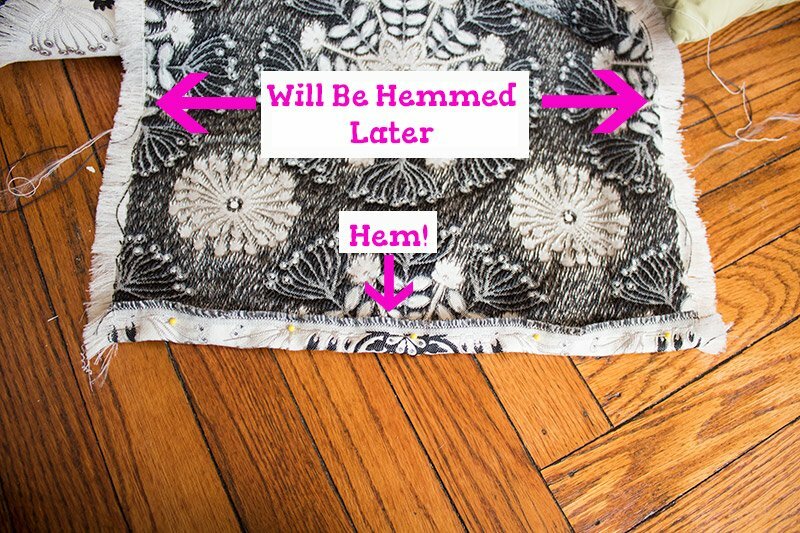 Fabric Remnant- Your fabric remnant needs to be at least the width of the pillow you plan to cover. 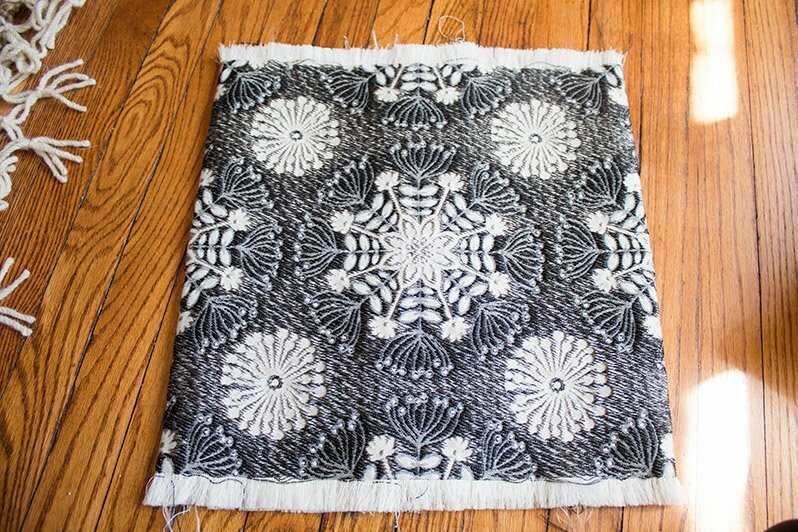 I got the fabric remnant used in this project at Joann''s, and it was their Kaleidoscope Tuxedo Waverly Multi-Purpose Decor Fabric. To determine the proper length, I wrapped the fabric around the pillow until it was taught. Then I added about 2 extra inches to account for hemming the side and overlap. I learned the hard way that my fabric has a real tendency to unravel in the wash, so I hemmed the edge I had just cut. The other end of the fabric was the salvage, which I left as-is since it's unlikely to unravel. The two long sides that were already unraveling would be sewn later when I put the pillow together, so I left them alone for now. I folded my pillow cover just like had I had wrapped it around the pillow earlier- with an overlapping flap on the back. 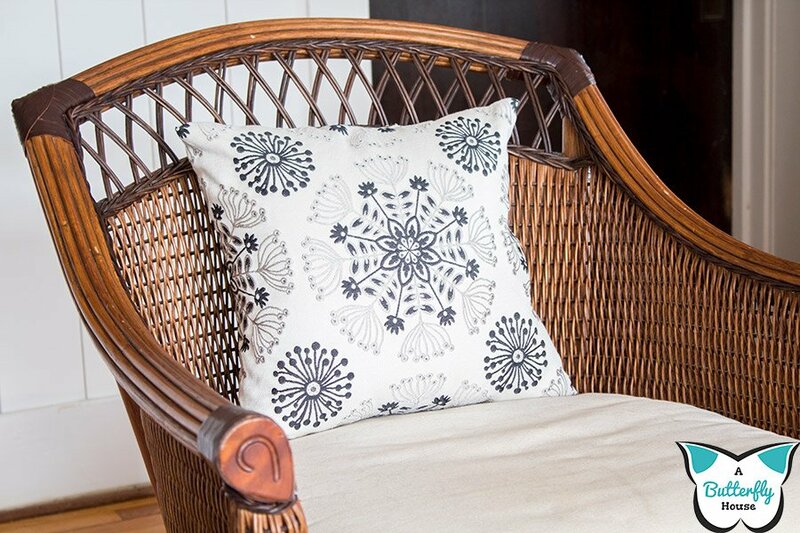 My fabric also had a large pattern that I wanted centered on the front of the pillow, so I made sure it was in the right spot before pinning. The back contained my overlapping pieces. Additionally (and super importantly), my fabric was pinned right sides together. 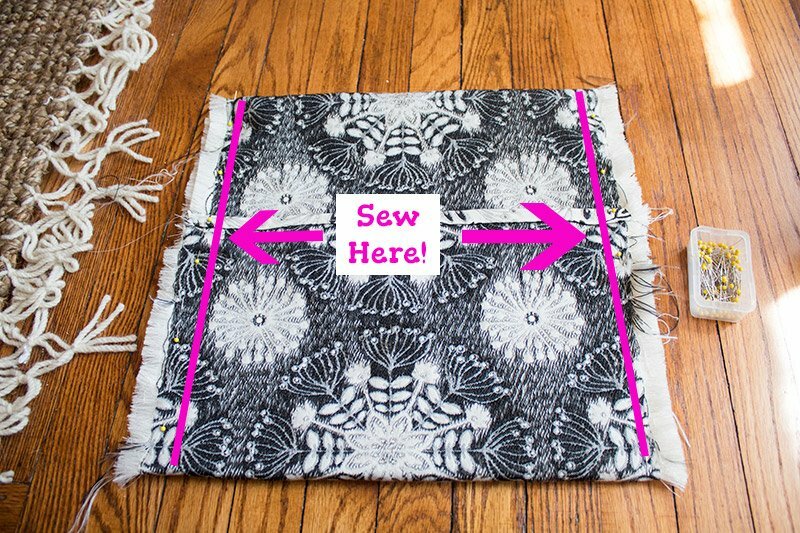 Sew each side of the fabric together as shown in the above picture. 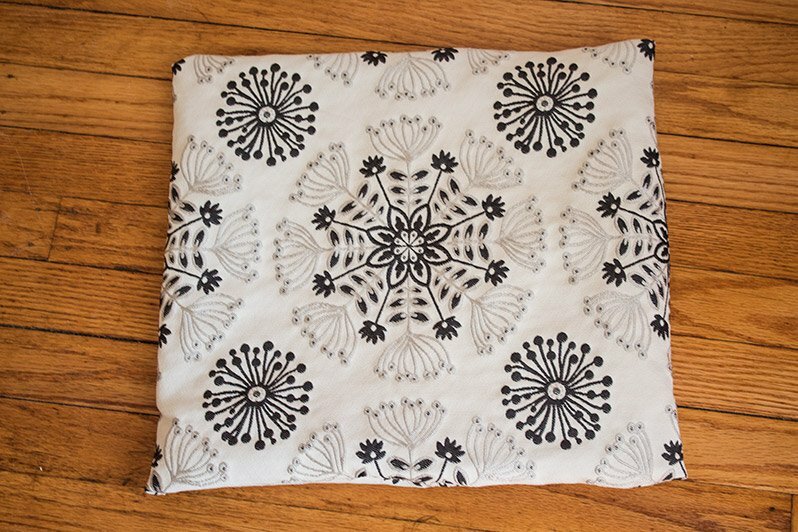 This makes a handy little envelope pillow cover. 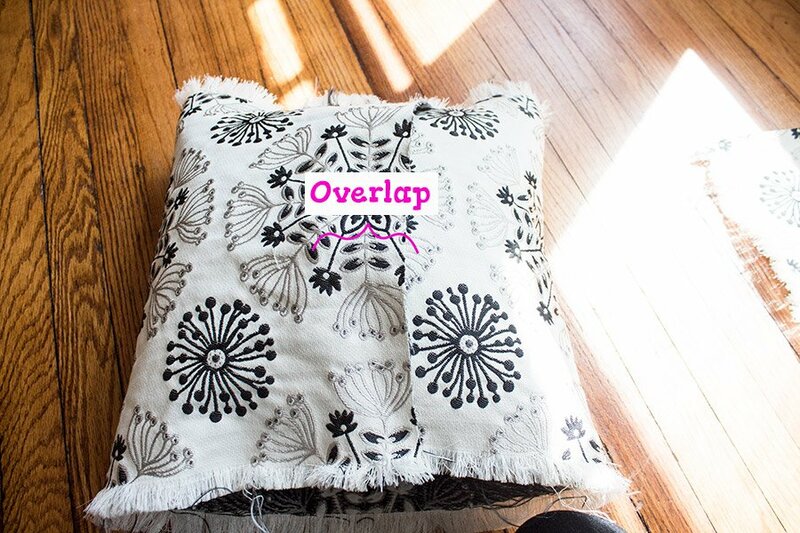 You can change out the pillow cover at will for washing (or just because you want a fluffier pillow!). Done in only three trips to the sewing machine! 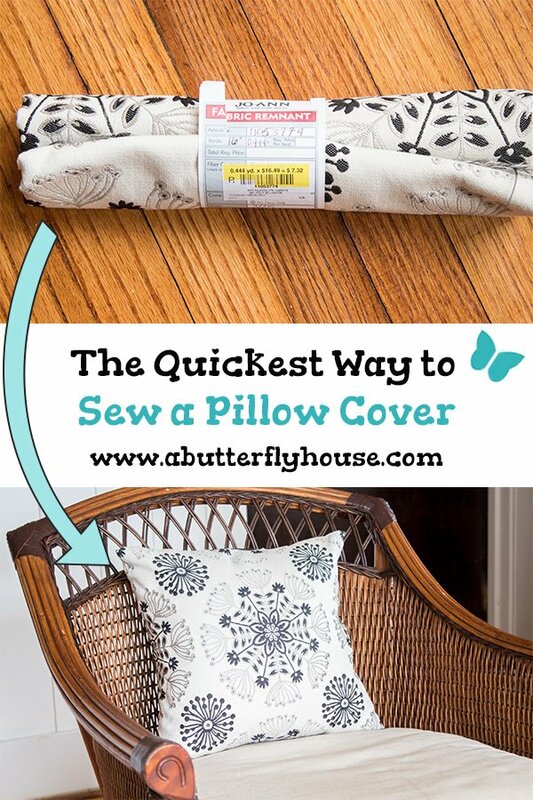 I used this same technique on a pair of pillow covers I made out of actual by-the-yard fabric. They look super pretty too! 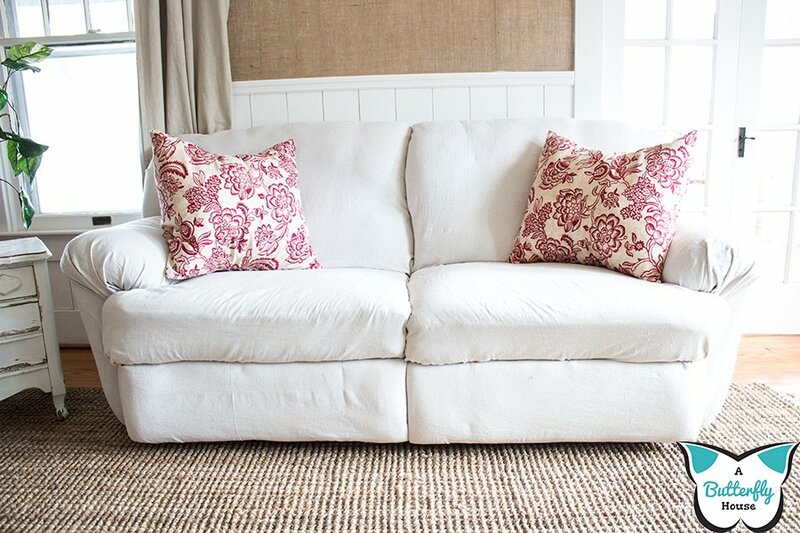 The pair in the photo below were made with Joann's Home Essential Lightweight Decor Fabric in Bircham/Red. 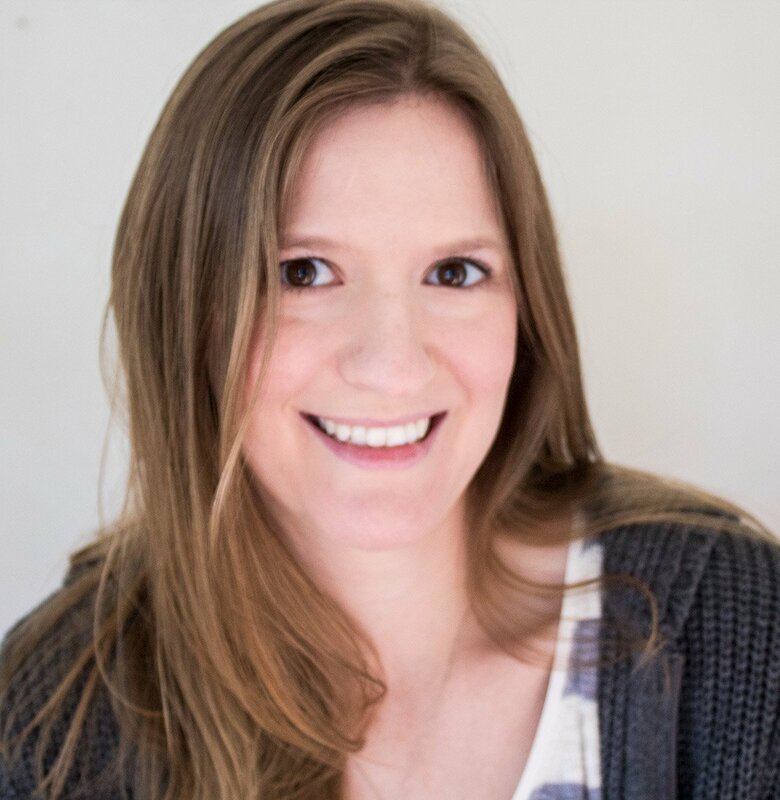 I also recovered that recliner sofa they're on- if you've ever wondered how to recover a recliner sofa, go check out the post! I am so pleased with the easy little pillows! If you too are inspired by the fabric aisle and remnant piles, go ahead and save this to Pinterest so you can find it later!